Each piece of beautiful reclaimed Texas Mesquite or Pecan will measure 12" to 18" in width (varies according to knots, areas where branches grew, etc) with 2 LIVE EDGES and approximately 3, 4, or 5 feet in length. See length variation to select desired length. Thickness is a manageable .75". After signing by guests, piece may be hung, leaned against a wall or laid flat. Please advise intended final use and we can attach hanging hardware or felt feet to prevent scratching of surface it will occupy (if desired). This reclaimed Texas Mesquite is lovely as a Guest Book alternative for a wedding, party or other special event. It is completely sanded on one side to a smooth finish to allow easier writing. It also has one layer of polyurethane finish. For best results, we suggest using a "sharpie" type permanent marker in a metallic or black color. As we now have a new laser engraving machine, this listing INCLUDES laser engraving of your names and date on the wood slice. Additional text will be quoted as necessary. Please include desired names and date in the notes to seller area upon checkout. 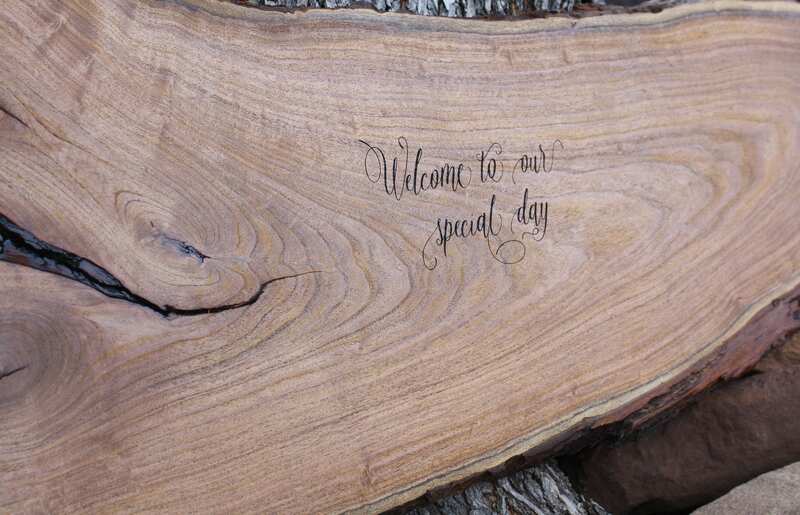 The engraving on this sample reads "Welcome to our special day", but you may choose anything you wish. The piece came out better than expected. They were able to work with me on the shape of the piece as well as the engraving style. They gave me a few different pieces to choose from, based on the info I gave them & they had it to me within a few days of receiving the final proof. Excellent craftsmanship.